Four East Belfast businesses have been shortlisted for the 2016 Women in Business Awards in association with Alexander Mann Solutions. Sinead Curran of Lagan Construction Group and Frances McVeigh of PwC have been shortlisted for Advancing Diversity in the Workplace. Sinead Dillon of Fujitsu has been shortlisted in the Best Professional Services – corporate – category. Katie Stevenson and Sarah Graham Walsh of Dundonald-based La Bella Vita Hair & Beauty have been announced as finalists in the Young Business Woman category. The ceremony, which will be held on Thursday November 17 at the Ramada Plaza Belfast, aims to honour and celebrate the achievements of the many businesswomen who make a valuable contribution to economic life in Northern Ireland. The category winners – along with the 2016 Outstanding Business Woman of the Year as voted for by the judges – will be announced at the gala awards ceremony on November 17 at the Ramada Plaza in Belfast and in a special in-paper supplement following the event. 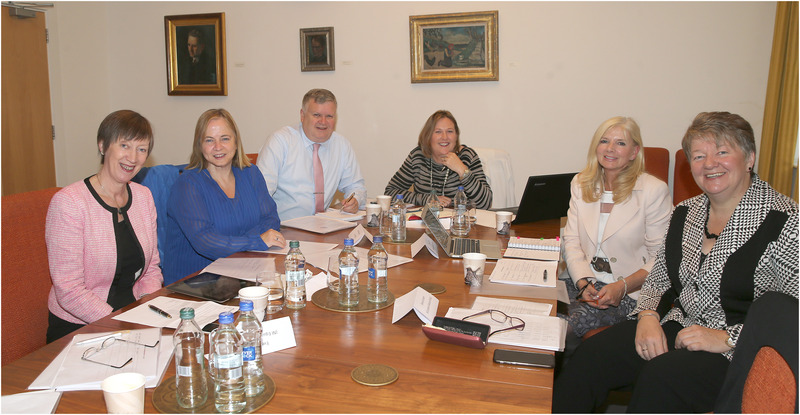 Photo Caption: Judges get to to work in deliberating over the shortlist for the 2016 Women in Business Awards. From left, Evelyn Collins, Imelda McMillan, Gary McDonald, Roseann Kelly (chairwoman), Hester Larkin and Ellvena Graham.